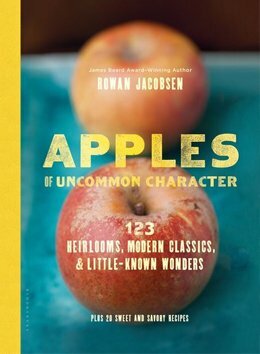 Thirty pages into Rowan Jacobsen’s Apples of Uncommon Character, 123 Heirlooms, Modern Classics, & Little-Known Wonders, Plus 20 Sweet and Savory Recipes (Bloomsbury USA, New York, New York, 2014) and I was considering how I had misspent my apple-eating life. I purchased whatever was inexpensive at the grocery store, without thinking about the whole apple universe that was out there. Picking those little labels off the skin without even thinking about what they meant, I never knew what stories lay behind those varieties. Jacobsen delivers those stories, and more. He inspires a wonder about the origin of apples you’ve had and those you’ve never been lucky enough to taste. His rich descriptions of more than 100 apple varieties, accompanied by Claire Barboza’s photography, will make you rethink this most commonly consumed fruit. Jacobsen explains that apples were first domesticated in Europe, where carefully managed farms resulted in only a few varieties. It was when those seeds were brought to the United States, where trees had room to roam and grow in different climates, that they spread their wings. The story of the apple, in some ways, is the story of America. The Newtown Pippin is one such American apple. The only variety to trace its origins to New York City (Queens), it was distributed in England by Benjamin Franklin on a visit. The English went nuts for the Pippins, but when they bought trees from the United States, they found the apples didn’t grow well in English soil, so they imported the fruit themselves. In fact, they imported so many Newtown Pippins that their domestic production was threatened and the government put a tariff on all imported apples. Jacobsen breaks the book down into sections: Summer, Dessert, Bakers and Saucers, Keepers, Ciders\Fruit, and Oddballs. Each type has its own particular strength, much the way dogs were bred to specialize in a particular task. Being an undisciplined reader, I skipped both the introduction and other apple sections and went directly to the “dessert” apples, which make up much of the book. Those are the ones meant to be eaten by hand without any processing, the ones tucked into your school lunch if you were lucky. The standbys most of us know are covered: Fuji, Empire, Pink Lady, Braeburn, Golden Delicious and, of course, (my favorite) the Honeycrisp. Each variety has a page explaining other names the apple is known by, its origin, region, season and taste. These descriptions alone make “Apples” valuable. Jacobsen won a James Beard Award because he can tell you how things taste. Oh, can he tell you how things taste. “You can already smell the banana as you raise the uncut apple to your mouth. Once you break into the flesh, banana and pear esters surround you. The apple is mildly sweet, passingly tart, and tropical, like one of the modern fusion juices,” he says of the Ambrosia, an apple of Canadian origin. There is a lot of that wine-like description in “Apples.” Ozark Golds that have a “rich marzipan finish” and Mutsus “have some tartness and even a touch of astringency.” Admittedly, like wine talk, this can border on pretentious, but more importantly, it makes you think about how things taste. I have never seen an Esopus Spitzenberg apple in my life, but that is going to change. Once you’re able to move beyond figuring out where you can buy an Orange Pippin or Esopus Spitzenberg and gawking at the photos, you’ll find an ingenious book that gives you the best apples to cook with and to use to make cider. It even includes a variety of apple recipes. Two pages at the end of the book entitled “Resources” note sources for (i) mail-order gift boxes of apples (including pre-Civil War apple varieties from Gray Wolf Plantation in New Oxford, Pennsyvania and the “fantastic” gift boxes of organic apples during the holiday season from Harmony Orchards in Tieton, Washington), (ii) mail order apple trees (including Trees of Antiquity of Paso Robles, California with its huge selection of organic apple trees and Vintage Virginia Apples of North Garden, Virginia with more than two hundred varieties of organic apples in the Charlottesville region), (iii) makers of artisinal apple ciders (including Steve Wood’s Farnum Hill Ciders of Lebanon, New Hampshire which according to Jacobsen “has the best cider orchards in America”), and (iv) apple festivals & events (including CiderDays held in early November in Franklin County, Massachusetts, the “highlight” of Jacobsen’s apple year and the “mecca for every serious cider enthusiast in America”). The only drawback is that I wanted more. Every variety should get the kind of treatment Jacobsen gives the lucky 123 varieties he gives in “Apples.” Luckily, he gives credit to Spencer Ambrose Beach’s 1905 book, “Apples of New York,” which he says is the best book about apples around. Perhaps I’ll find what I’m looking for in there, or in visits to formerly unappreciated apple orchards and add another variety of the uncommon apple to my bucket list. Slow Food USA’s Ark of Taste (which lists the “varied and wonderful foods in the USA that have strong cultural and regional connections”) includes 14 varieties of apples with information and leads on places where they are currently grown (including the Newtown Pippin and Esopus Spitzenberg varieties noted above).